Like circling vultures waiting to pick the bones of our historic old town developers are being lured by the Council’s ill-conceived Masterplan and the Site ‘G’ designation for the redevelopment of the west side of Bromley High Street from the Library down to the railway and beyond. 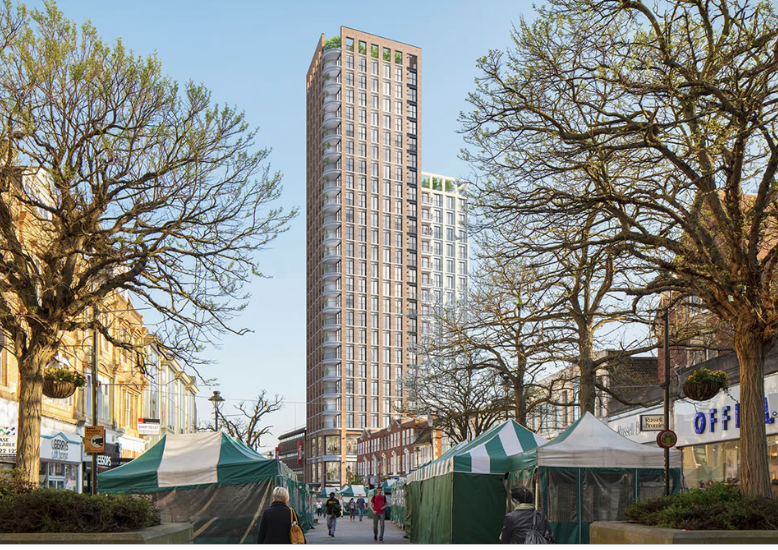 Bookending what would be an army of tower blocks is the Council’s existing St Mark’s Square development, aka the ‘Titanic’, at one end and their proposed 15 storey ‘Churchill Quarter’ at the other now said to be Phase One of the Masterplan. This is still awaiting a decision and if approved will overwhelm Library and Church House Gardens and used to set the general height standard of the Plan. This opportunistic proposal by S2 estates highlights the need for protection of the buildings deemed to be of architectural and townscape merit in the southern part of the High Street. These properties will be particularly vulnerable given all the development likely to take place around them. BCS have suggested in their response to the Masterplan that 66-70 High Street (formerly Maplins and adjacent properties) and 54-62 High Street (Laura Ashley and adjacent properties) should be included within ‘island’ extensions to the Conservation Area to give them long lasting and effective prevention. We hope that the Council will now see the merit in this and will go along with this suggestion. This entry was posted in BCS news, Campaigns and tagged 66-70 High Street, Campaign, High Street. Bookmark the permalink.